Light duty decorative scroll bracket for hanging address plaques and signs. 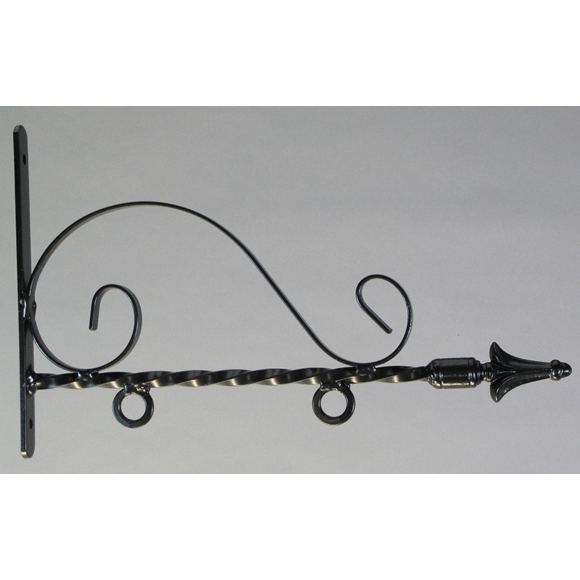 Made from 3/8" twisted steel rod, topped with decorative scrollwork, and finished with a spear point finial. Steel back plate. Our metal brackets to hang signs are available for small, medium, and large signs up to 24" width. This bracket is designed for light duty applications. The 12" version has an overall length including finial of 16". Ring centers are 6" apart (+/- 1/2"). Backplate is 1" wide, 10" tall, 3/16" thick and has two 5/16" diameter mounting holes. For signs up to 12" wide. Pictured in main image above. The 18" version has an overall length including finial of 21.5". Ring centers are 10" apart (+/- 1/2"). For signs up to 18" wide. Pictured in small left image above. The 24" version has an overall length including finial of 27.25". Ring centers are 14" apart. Pictured in small right image above. Please note when the 3/8" twisted steel rod is measured corner to corner, the measurement is 1/2". Light duty decorative scroll bracket for hanging address plaques and signs up to 24" wide with ring centers 6", 10", or 14" apart.